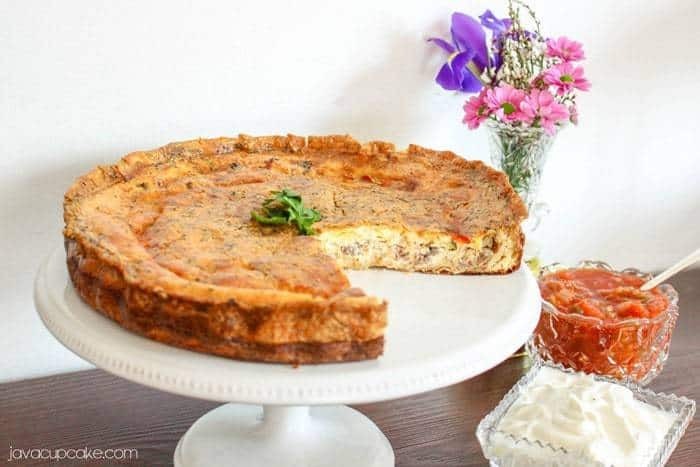 With Easter just a few days away, I prepared for you a delicious Southwestern Fajita Quiche that is perfect for Sunday brunch! I’m not going to pretend that I’m an expert quiche maker. In fact, this is the first I’ve ever made. Typically for breakfast, my family makes an egg scramble where we just throw everything into one pan and mix it all up until it’s cooked… fast, easy and delicious! But for Easter, I want to serve something a bit nicer, but still just as easy! 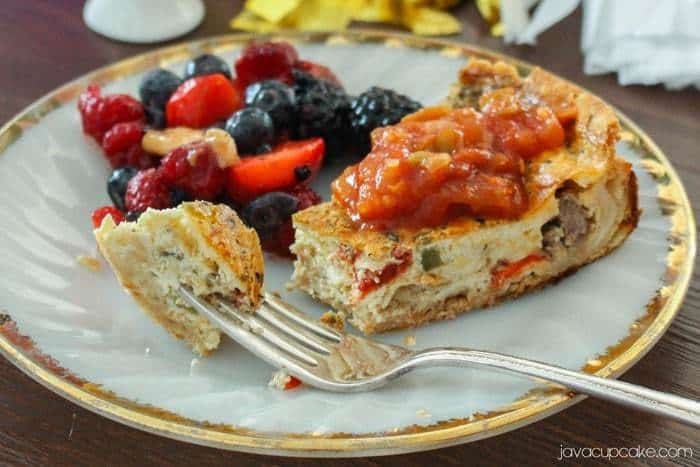 This is a Southwestern Fajita Quiche because it’s like your favorite fajita baked into a crust surrounded by delicious eggs. To make things simple, I used a package of stir fry steak from the grocery store so I didn’t have to trim and cut a big hunk of steak. If you didn’t want to dice up your veggies, you could just as easily use a bag of frozen stir fry veggies… but I like fresh, so that’s what I used! I also used already shredded cheese on top and only added the seasonings I had in my cabinet. 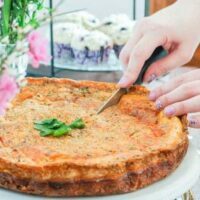 Not only do I love this quiche because it tastes amazing, but because it can be either served hot out of the oven, cold or at room temperature! Which makes it so versatile! 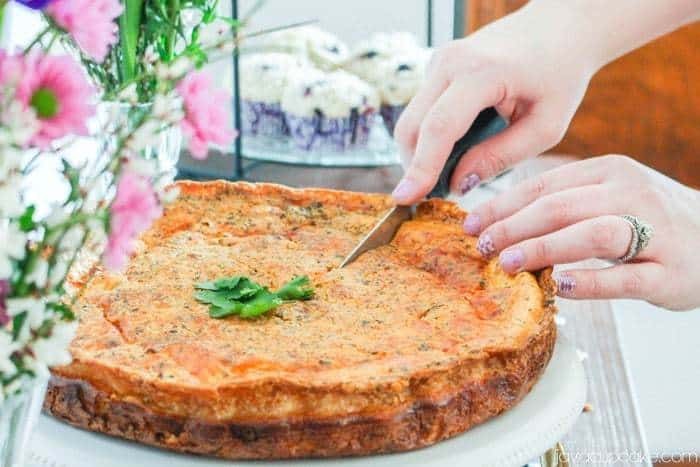 When my family ate this quiche, it had been sitting at room temperature for several hours and was so good! The next day we warmed it up and was perfection! I honestly don’t know which way I prefer it more! Oh a side note… aren’t my nails adorable? They are Jamberry nails and I am absolutely in love with them! The set I am wearing in this photo is from their new Spring line and is called Desert at Dusk. If you’re interested in getting them for yourself, contact my friend and consultant, Kristine Rego! She’ll help you out! 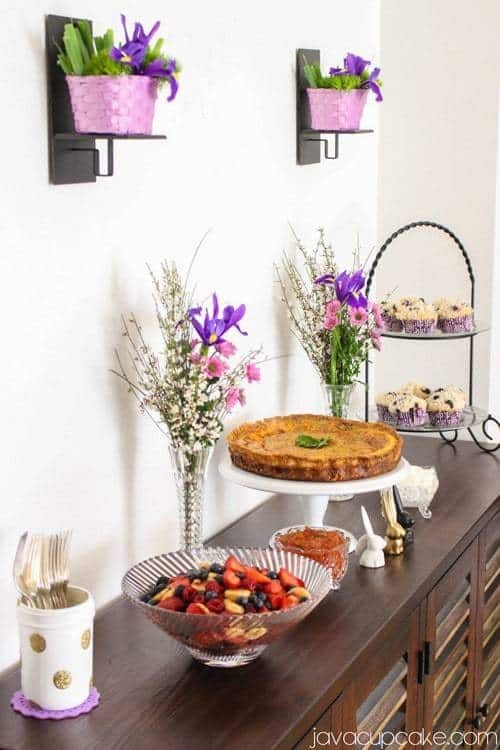 I served my Southwestern Fajita Quiche with sour cream and salsa for condiments and a simple fruit salad as a side. You really don’t need much more than that to complete this meal, but if you wanted to the possibilities are endless. Crème fraîche, chives, scallions, hot sauce. Yum! One slice of this full-flavor quiche and you’ll be full and happy for hours! For more about my Easter Brunch, check back tomorrow for an amazing collaboration with MyDIY.life! Bring the premade pie crust to room temperature then roll it out in a 28cm fluted, round baking dish. Gently press the crust into the pan making sure it's up against both the side and bottom of the pan. Trim any extra crust from the sides. Poke holes in the bottom and sides of the pan. Bake for 10-12 minutes or until the crust is firm and browned. Set aside to cool. In a frying pan, brown the steak over high heat and add salt and pepper to taste. Remove from the pan into a large bowl lined with paper towels to drain off any extra grease. Dice the steak into smaller, bite size pieces and place back in large bowl minus the paper towel. In the same pan, melt 2 Tbsp butter. Add the diced peppers and onion then salt and pepper to taste. Cook the peppers and onions over medium-high heat for 4-5 minutes or until they become tender. Add the cooked veggies to the bowl with the steak and toss together. Drain the can of tomatoes and add it to the steak and veggies and toss again. Sprinkle the meat and veggies with chili powder and chili peppers to taste. In the bowl of your stand mixer fitted with the whisk attachment, combine the eggs, milk and cream. Turn the mixer to medium-high and whisk for 6-7 minutes. You want this egg mixture to be light and fluffy. Add salt/pepper and chili powder to taste and whisk again for 1 minute. To the bottom of the prepared pie crust, add a even layer of the meat & veggie mixture. You may have some left over from this, but you want one single layer across the bottom. Slowly pour the egg mixture into the crust until it's about 80% full. Sprinkle an even layer of the cheese on top. Pour remaining egg mixture into the center of the quiche until it just reaches the top of the crust and a small edge can still be seen. NOTE: The quiche will collapse and shrink after baking so you want to fill it up as far as possible and still be able to move it. Sprinkle Oreagno over the top. Bake for 45-60 minutes or until a toothpick comes out clean. NOTE: You may need to create a foil shield for the sides, rim of the quiche to prevent it from burning. 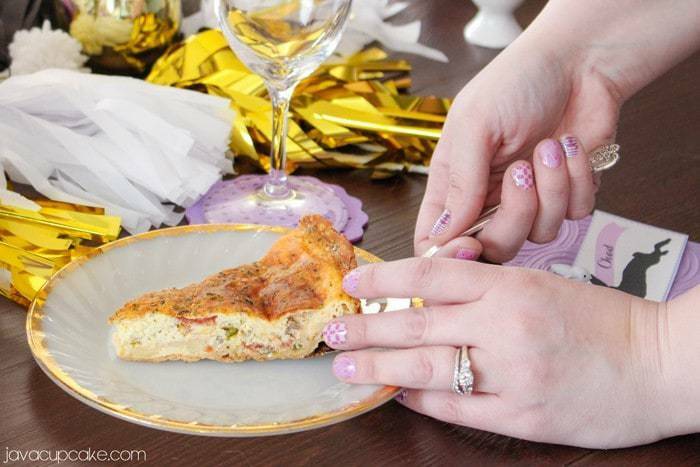 This quiche needs to be on my plate right now! It has all of my favorite flavors in it! My favorite flavors too, Julie!! I want to dig into that quiche! And your nails? SO CUTE!! Thanks, Beth!! I am in love with these Jamberry nails! This is absolute brilliance! I love it!